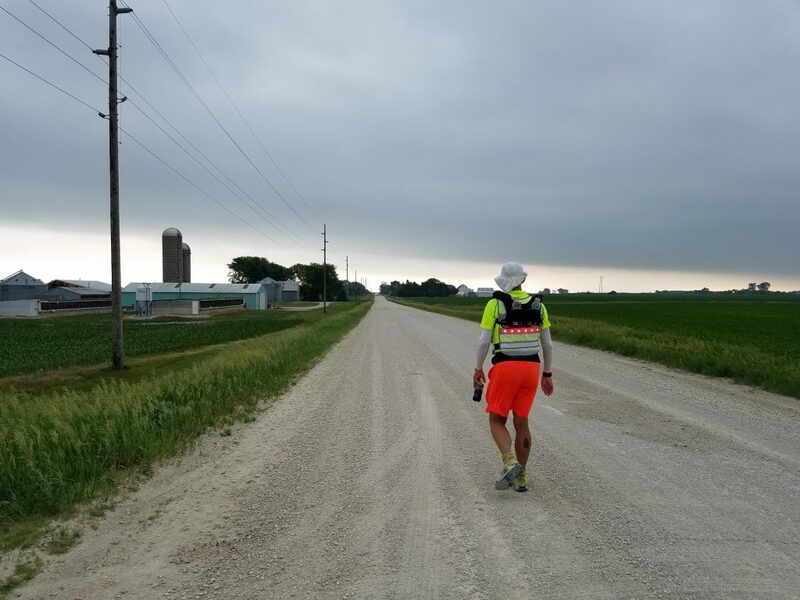 On June 10, 2018, with the help of my wife and crew chief Leslie Nolen, I completed a 339-mile run across Iowa. I’m asked: “Why Iowa?” The answers vary from facetious to strategic: Because it’s there. Because no one had ever run Relay Iowa (the longest relay in the world) solo. Because it’s training for an 870 mile run across Texas in April 2019 and a transcontinental U.S. run in 2020. To show people diabetics aren’t couch potatoes. To me, the more interesting question is: what did I learn that I didn’t know already? 1. Sleep isn’t just important: it makes the difference. When I ran from Austin to Corpus, I did it in 3.5 days, on 7 total hours of sleep. Toward the end, I was occasionally seeing things that weren’t there and my judgment was clouded. It made a lot of things more difficult, and it put all the responsibility for my safety in the hands of my wife. This time, when we ran Relay Iowa, we decided that we both would get a minimum of 6 hours of sleep a night, ideally 7.5, with the exception of the last day of the 7.5 day run, when we would have to wake up at 2 AM in order to finish during the same day. As a result, we were both able to think and discuss changes in strategy at the end of each day. We also had a chance each day to get a solid, filling meal instead of wolfing down something we had in the crew van. God bless Casey’s General Store and their hot pizza. It sounds cute to say that the monotony of running 339 miles in basically a straight line — though there were actually some turns here and there — can drive you insane. The reality is that it can take you part of the way there, for sure. I recall once around day 4 or 5, running east on the shoulder of a paved county road, encountering two cyclists riding in the opposite direction. I had my head down to keep my hat from being blown off by the wind-wake from semi truck traffic. To keep myself busy, I had been doing distance and time math calculations out loud, trying to figure out something to focus on to keep my mind in the game for the next few miles. One of the cyclists heard me talking to myself and stopped to ask if I was OK. That was a heads-up that I needed to get out of my head, eat something, stop for Gatorade or water, and assess what’s really going on. Because if I hadn’t been dressed as a runner, I’m not so sure the average policeman would have known the difference between me and a homeless man. All the more important if my sugar had been low — which, thankfully, it wasn’t. 3. Keep your route interesting — or MAKE it interesting. As Leslie and I are planning our route across Texas in the spring of 2019, one major factor is just how much monotony either of us can stand, and what to do about it when roads in west Texas run for 50-75 miles with nothing but sagebrush, mesquite, tumbleweed, and the wind. So far, we’ve made note of safe places to pull the van off the road (the shoulder of US-62 is notorious for mesquite thorns), where we’ll almost certainly make brief stops for me to cool down and get food from the van. We know we need to keep the breaks short or minutes will accumulate into hours, but in that part of the state, there are not even pull-offs for 20-40 or more miles at a time. So we’ve literally taken note of the random tree next to the road, the abandoned pump house, or the guardrail crossing a dry gulch, and marked them as attractions we can look forward to. That might sound pretty sad, but it’ll do. 4. Plan for weather delays. 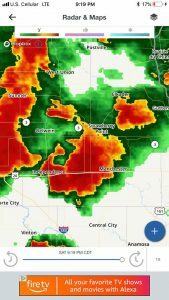 Running across Iowa, we encountered four separate thunderstorms, including one just outside Ellsworth on day 4 that turned into a hailstorm. We had to backtrack to a gas station about 10-15 miles and managed to get under the canopy before hail got large enough to damage vehicles. It rained for hours afterwards. And another on day 7 around midnight that lasted until well after our planned 2 AM start, after robbing us of another 8 miles of progress. Day 4 was supposed to be our second-longest mileage day, 53 miles. When those storms hit after 25 miles of running, we knew that wasn’t going to happen. We pushed 8-10 miles into each subsequent day to make up for lost time, and we regained all but 4 hours of it despite the final thunderstorm on day 7, so severe that the race director pulled all the regular relay team runners off the course and shortened their total distance to get them back on schedule. We had planned for blistered feet, which didn’t happen until mile 300. We had planned for serious fatigue, which didn’t happen until mile 325. We even planned running past the house from the movie Twister. We did not, however, plan on running across Iowa during the actual twister season. 5. Every run is different — even epic runs. At C2C, my biggest struggles were sleep and taking on enough calories. These two were probably related, as I was awake and burning fuel a lot more of the time than in Iowa. At C2C I lost 7 pounds in 4 days. At Iowa, I lost 3 pounds in 7.5 days. It’d be crazy not to consider that an improvement. At C2C, I didn’t want to eat. At Iowa, I ate voraciously. I was so insulin sensitive that I ate half a good-sized deep-dish pizza, washed it down with milk, and only had to bolus 2 units of insulin. At C2C, I ate a lot of yogurt, because I wanted cold protein, fat, and some sugar. At Iowa, it was Costco chicken salad cups I craved most. At C2C, I made it 180 miles before my feet blistered, and then they were full-foot blisters that were pretty painful and took 6 weeks to heal fully. At Iowa, I made it to mile 300 before blistering, and then they turned out to be little things that you could put a Band-aid on and forget about. At C2C, running into the night, in fog, drove me nuts. At Iowa, it was the constant gusting wind, the biting flies, and the hills. At C2C, I saw things that weren’t there and felt emotionally fragile. At Iowa, I was pretty rational but grimly determined and single-minded. The hills outside Sioux City were big, but I was fresh and I made good time. By the time I had a reprise of hills in Dubuque, I was sick of hills, bitterly skeptical about whether they’d ever end. Iowa and Texas smell different. Iowa has worse traffic on remote roads, and they’re straighter. It’s opened my eyes to just how different it will be to run across Texas in the spring. 6. Anything can affect your sugar — and it will. Heat, cold, humidity, fear, excitement, pain, fatigue, sleep deprivation, overfueling, underfueling, overdosing, under-dosing, stress, dehydration, cooked insulin, cold insulin, unknown nutritional content in food, irritated infuser sites, clogged infusers, side effects from drugs such as prednisone, your body’s own hormones, and glycogen dumping are just the first 22 factors that come to mind. Accept that you won’t be able to control all of them. Think like a pilot: good control is when you land with the wheels on the bottom of the plane. 7. In the end, it takes as long as it takes. 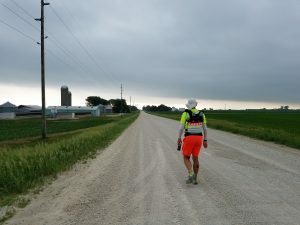 During our run across Iowa, several weather delays caused us to overshoot the “official” finish of Relay Iowa by 4 hours, even after making up time. Our participation was at arm’s-length to start with, due to our wishes to avoid liability issues in either direction if things went horribly south. So finishing by Relay Iowa’s official finish time was more of a personal goal than a make-it-or-break-it thing. Still, I wanted to finish in time to cross under Relay Iowa’s big banner and experience the crowds. Unlike the relay runners, we did not allow ourselves the luxury of being “pulled forward” on the course when weather delays hit. That meant that every little delay we hit was on us — we had to make up the time or get comfortable with not actually running all 339 miles across Iowa. We decided that the objective was to finish running across the state, however long it took. We informed the race director of our whereabouts, and he continued to drive by and encourage our solo team even though we both knew I wasn’t going to cross his finish line. The question becomes: what do you make of it? There were folks waiting when I got to Dubuque, and it turns out one of them made a “finish line” with markers and posterboard. I took that as a victory, rather than wallowing in a defeat that existed only in my mind. 8. It’s really about the people you connect with. I met so many amazing people of all ages, each with a story, as we crossed the state. As it turned out, many of those 29 Type 1 diabetic athletes Leslie and I met were waiting for us when we got to the improvised finish line at the Mississippi River boat dock in Dubuque, and at 9:08 PM Sunday June 10, I was greeted by a crowd of about 20 people that also included folks outside the T1 community, who just turned out to do Dubuque proud and greet a stranger like a friend. They lifted my spirits and I felt like I had done something really hard, finished doing it, and had a pile of good stories to tell. The longer and more unpredictable epic runs get, the greater the chance that you’re going to be delayed by storms, flat tires, insect stings or bites, swollen ankles, nausea, diarrhea, and god knows what else. If you’re overly focused on meeting a goal that was your best guess at a finish time, you’re bound to be disappointed. If you’re even remotely close to any of your original planning and objectives, good on you. That means you did your homework. I want to remember to focus on the big picture — not to get discouraged by stuff that really doesn’t matter in the long run. 9. The longer your run, the longer your recovery. After my solo run of the Capital to Coast Relay, I was tired, sore, and extremely sleep deprived. But I had only been running for a little under 4 days. I didn’t recover overnight, but it was fairly quick except for the blisters, which took several weeks to heal. After Iowa, I had been running most of the day, every day, for over a week. My legs were swollen and I wore loosely laced size 13 shoes for the ride back to Dallas (normally I wear a 12) and had to get out of the van every 2 hours or so to walk a little and temporarily reduce the swelling. For four days after Leslie and I got back, my calves and feet were swollen, and I dreamed constantly of not finishing the race, or being in the wrong race, or being in a totally different state. They weren’t exactly bad dreams, but in them, it was always late evening and they were shrouded in a mood of darkness and exhaustion. After a week, the dreams eventually faded and I was left with ankle swelling that lasted another 4-6 days. That, too, eventually went away. Then came occasional depression and a couple more weeks of fatigue. All extremely common symptoms reported by people who’ve completed epic runs such as the multi-day, 150+ mile Marathon des Sables, across the Sahara Desert. In fact, that was one of the best sources of information I’ve found about post-race symptoms and recovering from multi-hundred-mile runs. All of these fade with time. And I guess I can count myself in good company, even if running across Iowa wasn’t exactly the equivalent of running across the Sahara! 10. You must take time off and relax. It’s been a month now and I’m finally to the point where most of the symptoms are gone. I’m running again, though not pushing my pace, and started back up sauna training. I’m not exactly sure what my early objectives are after Iowa, but I know that I need to get back at it. Texas, and April, will be here in just a few months. That said, I’m not all that anxious to go beat on myself yet. Something in me says that it’s okay to relax a little, to go for a brisk afternoon walk and call it my workout, or to go hit the lake for a casual swim with a friend. Doing Epic Things inspires the doer as well as observers. It can make you push your limits and do things you’re proud of and want to share. But relaxing lifts the spirits in another way. It gives you a chance to breathe, and to think, and to reflect on what to make of your recent accomplishment — or hard-earned lesson. If things didn’t go as planned, you need the quiet time afterward even more, I think. 11. Reflect on what transpired, but look ahead. When I ran from Austin to Corpus, two newspapers wrote original articles that were syndicated by 11 media outlets. 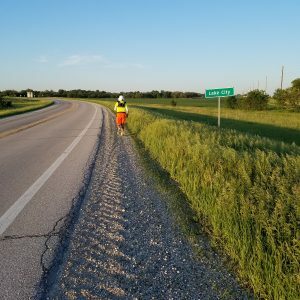 When I finished the run across Iowa, one county newspaper covered the story, and it was mostly about the local kid who ran with me. I’m OK with that. I’m proud of what I did in Iowa, and it’s time for others like Brayden to enjoy their time in the sun. Brayden was an awesome kid and it would do my heart good if the focus was on how, even before becoming a teenager, he’s mastered the kind of blood sugar control I went 40 years without mastering. I’m slowly allowing Iowa to become part of my story, wherever that story may lead. I’m not quite done with it yet; here and there I encounter little reminders that it’s still actively part of my personal narrative and a big part of why Leslie and I created T1determined. There’s a big opportunity out there to get out important messages about diabetes and exercise, to dispel myths and affect policymakers in a positive way. But I can’t focus solely on that. Now my body is telling me now that it’s OK to get back to training, but to ramp things up slowly. To focus on the next event, not the one that just passed. I need to learn how to run in isolated desert, up a 5000 ft. mountain, through a narrow mountain pass, and down that same mountain without slamming my toes into the front of my shoes on the downhill. How to deal with mesquite thorns, even more roadside gravel in my shoes, and a constantly unchanging landscape for the first 250 miles. I’m not an expert at any of these things. That journey is just beginning, and my mind needs to be in the game. That’s always the hardest part of training.